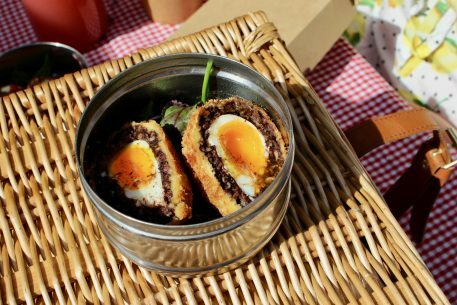 We’ve all tried to plan an idyllic Instagram / Pinterest perfect picnic that maybe hasn’t worked out how we originally planned – but fear no more. The National is here, armed with tasty tapas, sumptuous sandwiches and quench-your-thirst cocktails. Missing the picnic vibe? 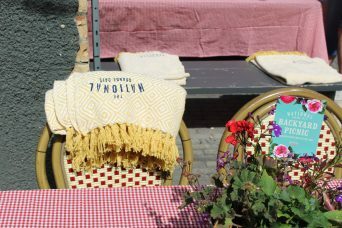 Well the red and white gingham, wicker hamper & embroidered beach blankets should do it. For only £27.50pp, you can enjoy your own city summer picnic in Belfast’s Cathedral Quarter with a choice of cocktail pitcher followed by a very carefully picked picnic! Available every Saturday & Sunday from 12pm, afternoon tea takes a backseat as the Nationals Backyard Picnic becomes a sought after Saturday sun spot. 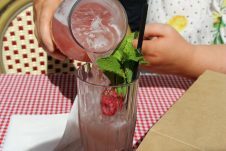 We started with the ‘Pink Picnic’ pitcher – Beefeater Pink, Rhubarb liquer, Lemon juice, almond syrup, cranberry juice & apple juice – the perfect appetiser for a refreshing afternoon. 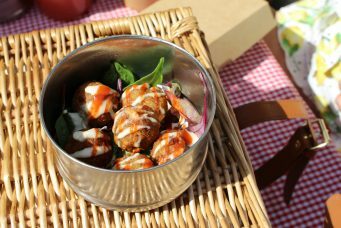 Soon after our gourmet sandwich of the day, our table was filled with savoury small bites that offered something for everyone (Sundried Tomato, Feta & Olive Salad, Spicy Falafels and Crispy Scotch Egg with Black Pudding Crumb). 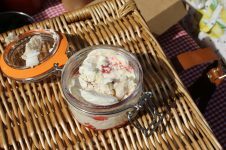 To end it on a sweet note we were treated to a fresh Eton Mess served in a Kilner Jar, with the National’s latest invention – ‘Pretzel Bombs’, a kind of cookie dough profiterole.